A Professional Bread Oven in My Kitchen? This is a very cool idea. Hot, actually. All of the artisan bread baking gurus (a Google search of that term returns 9,860,000 hits) tell home bakers how to create steam in their domestic ovens – spray bottles so that you can spritz water against the wall (yeah, hit the 500 degree element and see what that does! ), heating a cast iron frying pan then tossing in ice cubes (see the oven rack burn marks on my hands? ), using a roasting pan filled with water (the steam scalds as it billows up into your face and you – I – drop the damned dough on the oven door). This one is much, much better. Lava rocks, heated in the oven, then doused with water to make steam. Brilliant. [embedplusvideo height=”376″ width=”620″ editlink=”http://bit.ly/11lBw5O” standard=”http://www.youtube.com/v/cw2yQisZgzA?fs=1″ vars=”ytid=cw2yQisZgzA&width=620&height=376&start=&stop=&rs=w&hd=0&autoplay=0&react=1&chapters=&notes=” id=”ep1012″ /] The process works in an electric or wood-fired sauna – the Swedes, Norwegians and Fins have been using this method for thousands of years, indoors and out. The stones get hot, then you slowly pour water onto the boiling-hot stones to create a steam that springs your pores open and makes you gasp from the scald of it in your lungs. Oh, yeah. Lots of culinary fun. And blue air. I love eating bread, slathered with butter and a lashing of homemade freezer strawberry jam. 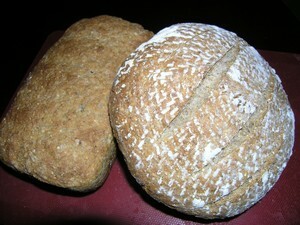 Bread is so basic, isn’t it – flour, yeast, salt, water. The recipe is much the same now as it was thousands of years ago. I like that connection to the past. Sometimes with butter or oil, sugar, seeds and chunks of savoury or sweet additions. I love assembling the ingredients for baking bread, especially in the winter, when the snow cloaks the deck and the scent of yeasty goodness rising from the well-kneaded dough warms the air. The feel of the living dough as it oozed through your fingers, yielding to the warmth of your touch. Ummm. I can whip up a batch of whole grain goodness chock full of dried fruits that have steeped to softness in freshly-squeezed orange juice. No, I take that back. I love baking bread in the summer, when I set the bowl of cool dough under the deck umbrella under an old dish towel and the heat of the mid-morning sun swells it to light and airy in no time. 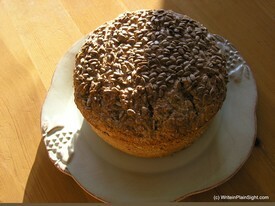 Stroke on some sweetened milk with a brush, top with sunflowers seeds that you lightly press into the crown of the loaf. It’s worth heating up the kitchen for an hour or so. My mouth is watering. Low-carb diets without bread – no way!